Family owned and operated, Chiawa Camp evokes a comforting and friendly atmosphere from every corner. 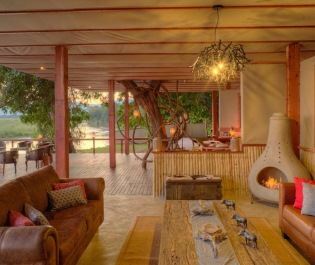 Found along the Zambezi River in Lower Zambezi National Park, this luxury tented camp just oozes rustic style and grace. All of the tents are secluded, raised on wooden platforms and offering stunning views. Tents I-VI are decorated in classic African safari style, with a gorgeous four-poster bed and a pull-up canvas wall at the front – perfect for a leisurely morning watching wildlife graze. Tents VII-VIII are rustic, with a clear canvas wall at the front and wonderful views of the endless floodplains, and the new Safari Suite is an idyllic and romantic option for honeymooners. Especially designed with privacy and intimacy in mind, the 220sqm suite has a gorgeous open-plan set-up, with a main bedroom, bathroom, lounge, and a wide veranda featuring a plunge pool, daybed and dining table. The idyllic surroundings have clearly inspired the light and airy décor and architecture here. We love dining under the stars right by the Zambezi River, and the boma-style swimming pool is fantastic for cooling off from an exhilarating game drive. This beautifully luscious park is teeming with wildlife, and so the camp offers a myriad of brilliant ways to spot them, from tranquil canoe safaris, to fascinating guided walks. Please not that Chiawa Camp will be closed from 31 October 2017 - 30 April 2019 due to the rainy season. Children over the age of eight are welcome.